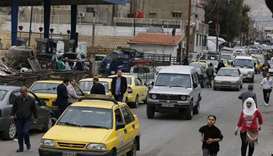 Syria on Monday stepped up fuel rationing as shortages became more severe in government-held areas, with an official blaming the shortfall on Western sanctions against the war-torn country. The Ministry of Oil and Mineral Resources is introducing a temporary measure to regulate the distribution of petrol to all vehicles. ‘Private cars will be given 20 litres every five days, three litres [will be given] for every three days, and taxis and public transport will be given 20 litres every 48 hours,’ the ministry said in a statement. On Sunday, the cabinet decided to reduce the quantities of gasoline allocated to government vehicles, set up mobile fuel stations and reopen closed stations, the state-run Syrian News Agency said. It added that all stations will be put under supervision of the Ministry of Oil to control the allocation of fuel and reduce any waste, smuggling or monopoly. A Syrian official, who requested anonymity, told dpa that the crisis was the result of economic sanctions imposed by Western countries on the Syrian government and Iran and that many Iranian tankers heading to Syria were far from reaching their destination. Many Syrian oilfields were taken and exploited by Islamic State when it took over large parts of the country in 2014. After the liberation of eastern Syria from Islamic State this year Syria's largest oilfield, al-Omer, has fallen into the hands of the US-backed Syrian Democratic Forces. All Rights Reserved Gulf Times.